The AN/SLQ-32 Electronic Warfare System is an electronic warfare (EW) system that provides powerful countermeasures protection for small and mid-size surface ships. The SLQ-32 systems feature a lens-fed multi-beam array that generates very high jamming power at continuous wave so that an almost unlimited variety of jamming techniques can be used. The SLQ-32(V)5 features sidekick active jamming capability that adapts the previous feature through smaller, lighter and solid-state components. Overall, the SLQ-32 electronic warfare system primary goal is to to counter radar-guided anti-ship missiles. This electronic warfare system was deployed by the US Navy in 1974 as the AN/SLQ-32(V)1 onboard frigates and landing platform docks (LPDs). The US Navy's AN/SLQ-32C(V)6 is a scaled-down version of the Surface Electronic Warfare Improvement Program (SEWIP) system developed for potential integration on the Littoral Combat Ship (LCS). The new electronic warfare suite features upgraded antenna, receiver and combat system interface to deal with new threats, improve signal detection, measurement accuracies and classification, and mitigate electromagnetic interference. The SLQ-32C(V)6 suite was tested onboard USS Freedom (LCS 1) in December 2014. By upgrading the systems, the AN/SLQ-32(V)7 is set to deliver threat detection and active radar-jamming capability. Critical Design Review is slated for 2016, while fielding is scheduled for 2019. 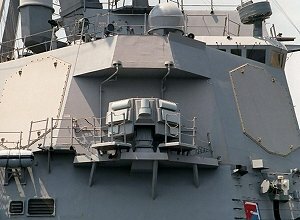 Northrop Grumman Corporation has been awarded a $91.7 million engineering, manufacturing and development (EMD) contract from the U.S. Navy to further mature system designs for the AN/SLQ-32(V)7 (SEWIP B3) electronic warfare system. Under the contract, Northrop Grumman will finalize integration modeling and test plans, and produce two prototype models for laboratory and field testing. This generational leap in capability is the result of an incremental series of upgrades which adds new technologies and capabilities for early detection, signal analysis, threat warning and protection from anti-ship missiles, coupled with critical enhancements in coordinated electronic warfare defense. The system enables Navy warships to counter threats non-kinetically.